St. Petersburg, Florida - Fort Desoto Park - Suncoast sea life seems to love the warm Gulf waters this time of year, and they're giving onlookers a show while they play. A group of dolphins in the water near Fort Desoto swam ahead of Michael McCarthy's see through canoe, and luckily he had his GoPro camera rolling. The group of six dolphins seemed casual as they led McCarthy's canoe forward, spraying water in the air with their blowholes. 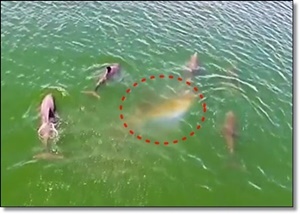 In the center of the pack, a dolphin's spray perfectly presented a rainbow, seeming as if the dolphin created the rainbow. McCarthy's camera also captured leaping dolphins, seeming to compete for which could jump highest above the water. Finally, three dolphins swam side-by-side, swaying back and forth, before crossing perfectly under the front of McCarthy's canoe. With the see though bottom, he was able to capture the moment seamlessly. The dolphins certainly seemed happy for an audience and McCarthy said he was glad to provide one.